The Boston-bound red-eye from Phoenix was somewhere over upstate New York Monday morning when Dr. George Abraham realized something had gone wrong. From his seat in the front row — 1F, he recalled — the associate chief of medicine at Saint Vincent Hospital in Worcester watched as a flight attendant burst from the cockpit — “white as a sheet,” he said — and grabbed an oxygen canister. It was just before 7 a.m. The pilot was mortally stricken. On board, passengers said, they heard only an announcement that the captain was not feeling well, and the plane would be diverted. Within 10 or 15 minutes, the 147 passengers aboard American Airlines Flight 550 were safe on the ground in Syracuse, after the Airbus A320’s copilot executed a smooth emergency landing. The emergency crews that had gathered at the Syracuse airport quickly determined that the pilot was dead of what Abraham deduced was apparently a heart attack. Flight attendants told passengers that a stop was necessary because the pilot wasn’t feeling well. Read: How rare are pilot deaths on commercial flights? Monday’s episode was an exceedingly rare occurrence that nonetheless requires safety protocols that ensure crews are able to compensate for an incapacitated pilot. Abraham said he spoke with the flight attendant, a former emergency room nurse, after the plane landed in Syracuse. He said she told him the pilot’s death was the result of an apparent massive heart attack, lasting 30 to 45 seconds. “I think immediately, if you hear you’re having an emergency landing, your brain goes to a dark place,” said Emma Glassman-Hughes, 19, who was on the flight coming back to Emerson College after a weekend at home in San Diego. “Nobody really knew what was going on, but the flight crew was very calm,” said Glassman-Hughes, who was only on Flight 550 because a previous flight was delayed. When the flight resumed after about three hours in Syracuse, a new crew had been assigned to fly the rest of the trip to Boston. The new captain informed passengers about what had happened. American Airlines said there were 147 passengers on the flight, which had a crew of five — two pilots and three flight attendants. “We’re incredibly saddened by this event, and we’re focused on caring for our pilot’s family and our colleagues,” airline spokeswoman Michelle Mohr said in an interview. Mohr declined to identify the pilot, whose death was the eighth during a commercial flight since 1994, the Federal Aviation Administration said. Those under 40 years old are subject to annual medical exams, according to FAA regulations. If a pilot feels sick leading up to a scheduled flight, he or she will probably opt against flying, said Greg Raiff, chief executive of Private Jet Services Group in Seabrook, N.H., which arranges flights for companies and government agencies. Commercial airlines have reserve pilots and crew members on call in case they are needed to fill in on short notice. “Pilots want to get the job done, but they’re not going to go do it if they’re feeling very ill,” he said. Audio: Listed to copilot’s communications with air traffic controllers. Aviation specialists say episodes like Monday’s emphasize the importance of the medical exams. When such an event does happen aboard a commercial flight, federal rules dictate that the plane land as soon as possible. “It becomes a race to the ground when you have only one pilot,” said Raiff. FAA regulations require that there be at least two pilots on US commercial flights, Raiff said, so if one pilot dies, the flight is technically flying in violation of federal rules and therefore must make an emergency landing. “The disability of the captain is certainly a situation where you’d need to have a backup pilot because planes don’t land by themselves,” said Paul Hudson, president of Flyersrights.org, an airline passenger group. “It’s a highly charged situation,” he said. 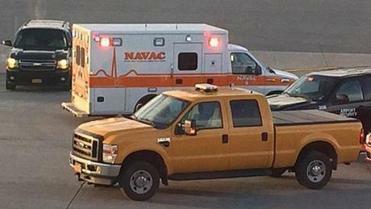 On Monday’s flight, crew quickly radioed air traffic control in Syracuse to request an emergency landing. “Captain is incapacitated,” a crew member reported at 7:01 a.m. — barely five minutes after Abraham estimated the flight attendant had first burst from the cockpit. The plane was on the ground 10 minutes later, where ambulances and police were waiting and the pilot was declared dead. Glassman-Hughes, the Emerson student, said she has always been a bit of a nervous flier. But she said Monday’s sad events wouldn’t add to that. “Now that I’ve seen the way that crews are trained to handle it, I might feel even more comfortable,” she said. Globe correspondent Sarah Roberts and Andy Rosen of the Globe staff contributed to this report. Nestor Ramos can be reached at nestor.ramos@globe.com. Follow him on Twitter @NestorARamos. Catherine Cloutier can be reached at catherine.cloutier@globe.com. Follow her on Twitter @cmcloutier. Matt Rocheleau can be reached at matthew.rocheleau@globe.com. Follow him on Twitter @mrochele.